Brief: AndMine were tasked by AdMark and Etihad Stadium to make mobile versions of the Edihad Stadium Medallion Club and Axcess One Microsites which would render exactly the same across all mobile devices. Solution: AndMine’s Web Design and Production Teams worked together to design and develop mobile versions of the above sites, bringing them online within a short time frame. 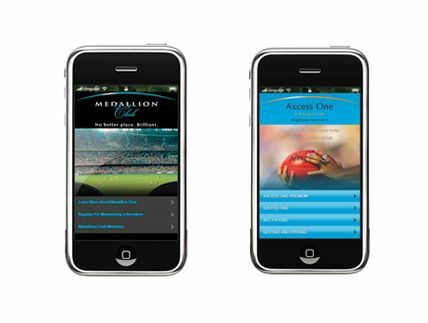 Go on, see if you can challenge us on "Etihad Stadium – Mobile Websites" - Part of our 159 services at &Mine. We are quick to respond but if you want to go direct, test us during office hours. To complete the form, please enter or complete the highlighted fields. Content © 2001–2019 All Rights Reserved. ANDMINE and &MINE are a worldwide registered trademarks of AndMine Pty Ltd.
TL;DR we are fast becoming a Worldwide Digital Agency - AndMine offers digital agency services to customers from all around the world. Digital Agency Sydney - Our new office brings the AndMine digital agency philosophies to Sydney offering end-to-end services including; creative, digital marketing strategy, digital marketing agency services, ecommerce store design and development, mobile apps development, and online marketing agency services including social media advertising agency services and Facebook advertising & marketing services. As an Australian web development company in Melbourne, Sydney & Gold Coast we're delivering business advantages online and offline. Digital Agency Melbourne - Our Digital Agency's headquarters in Melbourne produces some of Australia's most influential digital strategy and developments. Run by a collective of success driven engineers, creatives and marketers our work and your results will speak for themselves. We are fast becoming the go-to web design company in Melbourne, Sydney & Gold Coast for our expertise in the niche because of our BigCommerce Design & Development services, creative design services, software, digital strategy, advertising and online business success. With our in-house Magento designers and developers, we are also one of the best magento design & development agency in Melbourne, Sydney. Digital Agency Gold Coast - Our office in Surfer's Paradise, Gold Coast signifies our rapid growth and increasing demand of our services in the area. As the driving force behind the success of some of the leading brands in Australian digital marketing landscape, we have established ourselves as a reputed app development company with expertise in iOs app development, Android app development & web app development. Apart from these we offer CRM development services that stand out.As leaders in digital marketing, we are one of the best SEO agency in Melbourne, Sydney and Gold Coast. Not only Google, we are expert in integrating WeChat Payment in Australia and in Chinese SEO services . Read our Baidu Search engine optimization guide .As google adwords certified agency we offer some of best PPC Management Agency Services in Australia with the best conversion optimisation services. Contact us today to see how we can help you win! &Mine team is a melting pot of technology and creative minds. Each year, we slice a few percent of our bandwidth to develop our own commercial projects. For example, we have developed a prototype Posture Detector with the help of Melbourne University's Engineering Department that will send signals to your smartphone and vibrate if your posture is poor. We are also improving our suite of cloud based software applications like Meet&Mine, our Networking Software. During its first year gathering data, it referred over half a million dollars of real business for a small Melbourne network group. If you’d like to know more about our laboratory projects and how you can get involved in capital raising, marketing or support, simply contact us. Branded sans words, merchandise for those in the know. We'd love to keep you in the know - please fill out the form below. Please select a platform below to share this post.